For anyone reading this thread in the future. The Esbilac issue has resolved itself. on the can is Dried Whey Protein Concentrate. We NO longer recommend Fox Valley 32/40 ever. In light of the recent problems rehabbers have been experiencing with Esbilac formula, it has been decided that the best alternative is Fox Valley 32/40. In the meantime you will need to feed your baby a home-made formula, but please for the sake of the baby, do not feed this for more than 4-7 days. It's a great temporary replacer milk but it lacks certain vitamins and minerals that the babies need to thrive. This recipe will ensure that your baby will be well nourished until your order from Fox Valley arrives. Jackie (Jackie in Tampa) has graciously offered her temporary replacement formula recipe. Last edited by Nancy in New York; 05-20-2017 at 09:32 AM. Hey, IR. I haven't been on here much lately, but in trying to be prepared for upcoming baby season I am trying to find which formula has replaced Esbilac as the formula of choice. I never did personally experience any probs with the Esbilac powder, but I don't wish to take any chances. Legomom sent me this link. One thing I am not clear on: The squirrels will need 2 separate formulas? One formula for under 3 weeks and then the other formula for 3 weeks and over? Any help on this would be appreciated as I am trying to get prepared by having formula on hand. Before, it was no problem since I could purchase Esbilac locally, but this formula I will need to order. Thanks for the advice!!! Oh, yeah. A local rehabber who does mostly bunnies and birds of prey, but also some squirrels used Zoologic and she swears by it. Any thoughts on that? However, I trust Shanon's opinion so I will be going with the Fox Valley. I was just wondering about the other formula. Liz, the two Fox Valley formulas are offered so that after 4 wks of age rehabbers could switch to a higher-fat version, the 20/50. As for the Zoologic, I've never used it, but I believe you must combine it with MultiMilk, another Pet Ag product, in order for it to be right for squirrels. I'm not an expert on this one so maybe someone else will chime in. The reason we don't recommend Zoologic is simply that having to combine two separate products is daunting for inexperienced but well meaning folks trying to save a baby squirrel. It is really too bad that now there is no formula that is sold in retail stores -- everything must be ordered by phone or on line. Last edited by Administration; 04-22-2011 at 03:26 PM. Thanks IR for the info. I was just a little confused. The rehabber that uses the Zoologic never mentioned Multimilk, but then again, I wasn't too interested in other formulas at that time since I was having no issues with the Esbilac. I always added whipping cream and yogurt to the Esbilac. Will I need to add those to the Fox Valley as well? Lots of questions, I know, so sorry about that !!! Just want to be sure I am up to date on the latest!!! No need to add anything to Fox Valley. IF you have a baby who isn't bulking up as much as you'd like, Fox Valley does have a product called Ultra Boost which is a higher fat supplement to go with the regular formula. FV developed it in response to some rehabbers who reported that their squirrels were much more muscular than when they had used Esbilac, but were not as chubby. This summer I did hear (through the Squirrel List and from Chris' Squirrels and More announcements) about some rehabbers having trouble with diarrhea and failure to thrive with Esbilac, but our facility never did have any widespread problems (we raised almost 120 babies from July through October). I suspect a lot of what we used this summer was the "old formula", but not all. Another difference may be that we've always used Esbilac + Multimilk for eyes-closed babies, and Esbilac mixed with 2 parts water for 5 wks and up, which I think is a different protocol from the folks who had problems. But I guess my main question is, is there a definitive answer about what was "wrong" with the Esbilac and why we should move away from it? The things I read said PetAg had moved to a different manufacturing process, and at first people said it had too much fat content, then later said the opposite was true and to add cream. By that point I gave up on following the story because I wondered if any of it was truly fact-based. And if there are documented problems, is PetAg going to do anything to change the formula back? I apologize if this is re-hashing something I should already know, but I'd like to be clear on what the issues are. We have a large quantity of Esbilac stock now, and I don't think our wildlife hospital will be willing/able to replace it. If used in combination with the Multimilk is it workable, and what symptoms should we look for to know if it's not working? I wondered if any of it was truly fact-based. I called PetAg personally this summer and they told me that the processing was changed and that they were not planning on changing back and that their first priority was feeding PUPPIES and not squirrels even though they knew it was being used for squirrels. They did appologise for the problems but repeated that they made this product for puppies. Maybe this new process didn't affect all baby squirrels since many reported they had no problems but we all decided it would be best to use FV since it really is formulated for squirrels and all who use it have nothing but good things to say about it. That's exactly it. No one is quite sure why the 'manufacturing process change' made such a huge difference in baby squirrels (and bunnies too, I think). But the fact that so many had babies sicken and sometimes die with killer diarrhea -- well that IS a fact so TSB can no longer recommend Esbilac in good conscience. Most likely if your facility was using some 'new' Esbilac with MultiMilk and had no issue with it, then that's okay. However, you can understand why TSB did not choose to recommend that option, since for first-time squirrel baby rescuers it's far too confusing. Esbilac is available in some pet stores but MultiMilk is not....after much discussion, we chose to recommend Pedialyte and a goat's milk formula (both available in stores) for the first day or so while awaiting the Fox Valley. Quick question on the Fox Valley. I like to give my pet grey squirrel, Bean, formula just to ensure she is getting enough calcium. She is 4.5 months old now and have always used the Esbilac but don't want to any longer since we have had so many issues with diarrhea. What Fox Valley formula should I use as she grows into adulthood? You should use the Day One 20/50 for squirrels 4+ weeks and older. It has a nice high fat content and she will love the vanilla taste. I was talking to Nonda about the formula issue at the Michigan conference and she has no issue with fox valley, but she strongly recommends keeping with the fox valley 32/40 formula and NOT switching when the squirrels are older to the 20/50. The extra fat is good, but the reduced protein can be detremental to their development. Not enough to kill them, but they need the protein to grow. She recommends adding in heavy cream if they need the extra weight boost from fat. Does anyone know if the Zoologic 33/40 and Multi-Milk were changed similarly to the Esbilac? I had a problem with Multi-milk this fall with massive diarrhea and a bunny died. Not sure if it was a bad can or what. I really don't trust PetAG much at this point. I have received my new Fox Valley formula and LOVE IT! 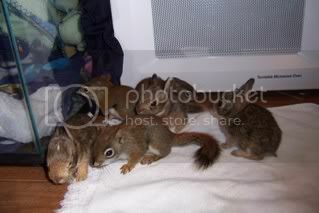 All my squirrels, including the litter of three (5 week olds) have had it now for two weeks. There is no constipation issues what so ever. 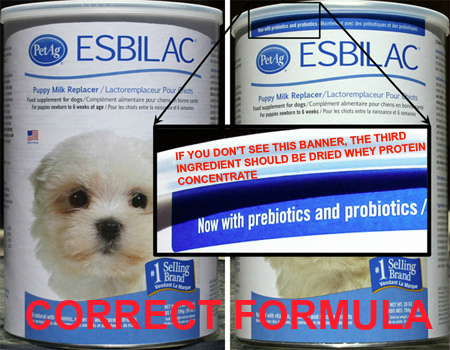 I will never use Esbilac again because of the extreme reaction my little ones had to the new formulation of Esbilac. Fox Valley is extremely affordable and the owner was great about overnighting some to me prior to the holiday. I wanted to share how well all of my critters are doing on this wonderful formula. but I add yogurt and heavy cream to any formula...that's what makes it formula...! FV does not mix as well as the old Esbilac did...and FV gets very thick when I add yogurt and Hcream... I always add extra water to help dilute it down to a thinner consistancy..still thicker than I prefer...but I do like it...the 32/40 smells so dang good too...just like IR said...vanilla cake! The thickness and not such good mixing is one of the main things (besides the bloating and diarrhea) that I hated about FV formula. I tube my bunnies and I would go through so many tubes because it clogged. This year it seemed to mix quite well, although I was so greatful to have something that would help the squirrels gain weight that it could have been pudding thick and I would have been happy . Do you keep your FV in the fridge? I am having much better luck now that I refridgerate it (I didn't used to because the wildlife center where I volunteer doesn't and it doesn't say to on the package). Fox Valley ROCKS! I found them while researching nutritional needs of a squirrel after Hurricane Charlie left me 3 babies and a rehabber who was overwhelmed with over 300 baby squirrels of her own. Boy ... it was a busy hurricane season for her and all those orphaned squirrels. For those unfamiliar with Shirley, she and her husband Allan are highly respected experts in wildlife rehabilitation, with particular emphasis on squirrels. Her rehab sanctuary, Wild Again (www.ewildagain.com) is one of the finest of its kind according to many rehabbers nationwide. As a graduate of the Caseys' 2-day Squirrel School, I can say it was the best 14 hours I ever spent in a classroom in my life. Shirley is a top-notch researcher and has been closely monitoring and studying this Esbilac problem since last year. I personally will never go back to Esbilac, but for those wish to -- Shirley will tell you how to do it right. Anyway, this research finally explains why some rehabbers had such problems last year while others did not -- the changes in solubility and compactibility of the new process Esbilac were the issue. Since the product is no longer "instant mix", rehabbers who prepared the formula by just stirring into warm water and serving immediately had problems with diarrhea (and worse), while those who routinely made a days-worth batch of formula with hotter water, used more agitation, etc. did not. Using Multi-Milk or cream in addition to Esbilac also helped. Anyone who wants to continue using Esbilac (as I will) really needs to read this report to understand how to prepare it correctly and avoid problems. I can report that the new process formula (combined with Multi-Milk) is producing great results so far this season. My pinkies have thrived on it and are about 3-4 weeks old now with normal stools and good weight gain. As the Caseys have said in their Squirrel Rehabilitation Handbook, there is no one "correct" formula to use in raising squirrels. So there certainly doesn't need to be an ongoing FV vs. Esbilac vs. Zoologic controversy.